PAGlink has been designed to power the full range of equipment used by broadcast stations, hire facilities and production companies, such as HD DSLRs, handheld camcorders, broadcast cameras, high-end digital cinematography and 3D camera set-ups. 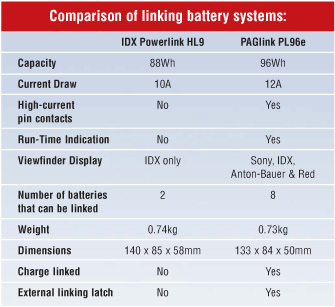 PAGlink is a system of smarter, smaller and lighter V-Mount, Li-Ion batteries, with a greater energy density than other systems. 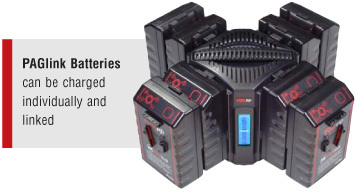 PAGlink batteries link together to multiply capacity, and run-time, allowing a high-current draw of up to 12A. The individual batteries have capacities of 96 watt-hours, enabling them to be legally transported by passenger aircraft without quantity restriction. 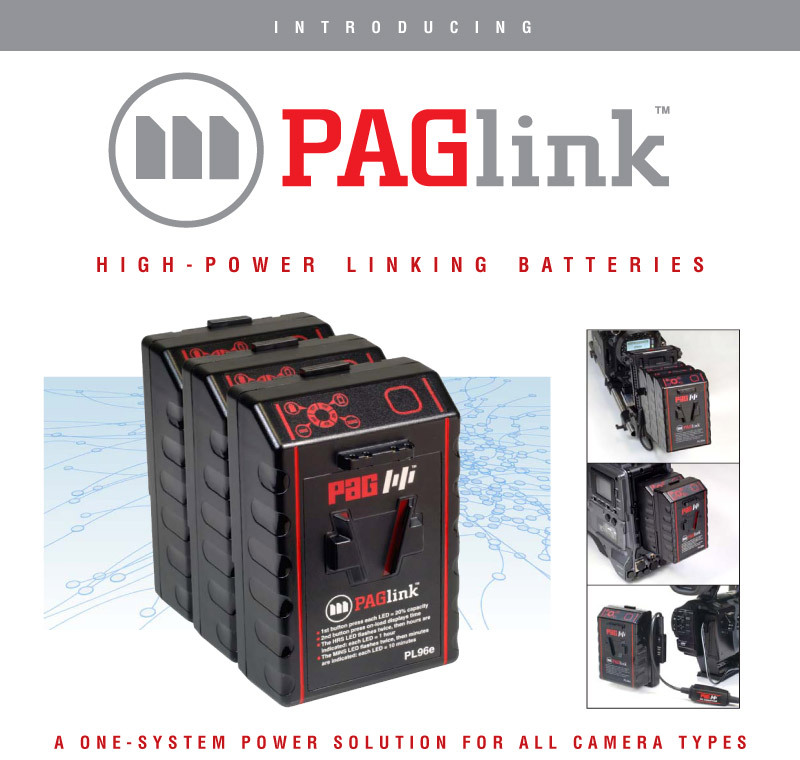 PAGlink is the only system that allows you to link multiples of batteries - two, three or more - on your camera. Three linked batteries, weighing less than 2.2kg, create a single unit of nearly 20Ah (288 watt-hours), greatly extending run-time. PAGlink batteries incorporate heavy duty contacts, engineered for high-drain applications, enabling high-loads of up to 12A to be drawn. The PAGlink system creates an intelligent network, enabling the batteries to communicate with each other and operate seamlessly as one. The network automatically reports to the camera the total capacity and current capability of the batteries connected. It also controls the charging and discharging of the batteries whilst linked. 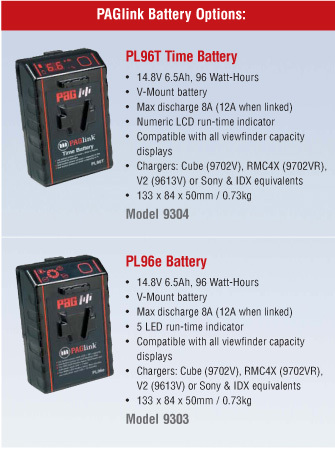 PAGlink batteries can be charged, whilst linked, on any V-Mount Li-Ion charger, such as the PAG Cube, or the equivalent IDX and Sony chargers. This enables you to top up all your batteries overnight on one four-channel charger, if necessary. When fully charged, batteries will stop accepting charge automatically and independently. All PAGlink batteries feature built-in run-time indication. You can choose between the numeric LCD of the PL96T Time Battery or the 5 LED display of the lower-cost e-series PL96e battery. Both displays also indicate battery capacity as a percentage. When the batteries are linked the individual displays provide capacity and run-time data for the batteries' combined capacities. The different battery versions can be mixed, enabling you to add the Time Battery display to the lower-cost e-series batteries. PAGlink batteries incorporate viewfinder display recognition software that supports all information systems. This enables multiple batteries, working as one, to communicate their collective state-of-charge for display in the camera viewfinder. The batteries adapt automatically to each viewfinder data system. PAGlink batteries incorporate PAG's multi-level proprietary electronic protection system and have Parylene coated internal circuits to guard against the effects of electrolyte leakage. The PAGlink System comprises 96 watt-hour battery packs that are independently tested to United Nations standards, and are therefore fully compliant with IATA air shipping regulations. PAGlink batteries can be legally transported on passenger aircraft, to any location, without quantity restriction. Batteries that have capacities greater than 100 watt-hours, and batteries that have not been UN tested are restricted for air transportation.